There's a PetKind treat for every occasion and palate. Our wholesome line-up makes you feel good about spoiling your furry one. We've crafted our treats with wellness and desirability in mind. Use as a training reward or healthy treat anytime. Great for all dogs, all sizes! Easily broken along perforations to use as a training treat. 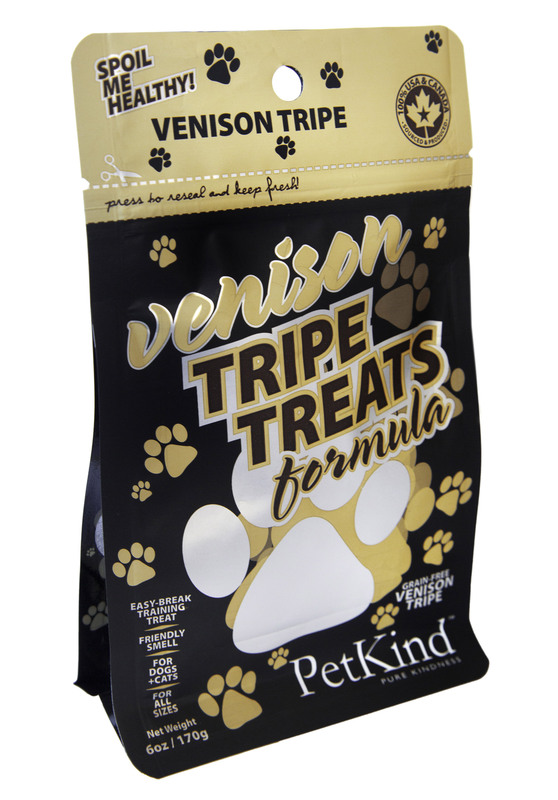 PetKind Venison Tripe Treats includes the benefits of green tripe, in a convenient to feed and friendly smelling format. This product is easy to break into training-size pieces, and can be fed to dogs of all sizes. PetKind Green Beef Tripe Treats features only 1 ingredient: Green Beef Tripe. This smelly dehydrated treat is just what dogs love - extremely palatable and 100% Pure Green Tripe! PetKind Green Lamb Tripe Treats includes the benefits of green tripe, in a convenient to feed and friendly smelling format. This product is easy to break into training-size pieces, and can be fed to dogs of all sizes. PetKind Green Pork Tripe Treats includes the benefits of green tripe, in a convenient to feed and friendly smelling format. This product is easy to break into training-size pieces, and can be fed to dogs of all sizes. PetKind Green Bison Tripe Treats includes the benefits of green tripe, in a convenient to feed and friendly smelling format. This product is easy to break into training-size pieces, and can be fed to dogs of all sizes. PetKind Green Beef Tripe Treats includes the benefits of green tripe, in a convenient to feed and friendly smelling format. This product is easy to break into training-size pieces, and can be fed to dogs of all sizes.